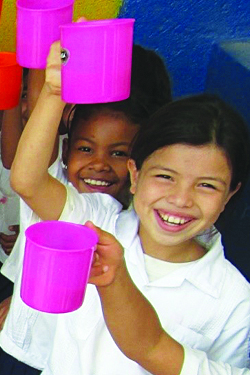 The Honduran government, working with the WFP, has a plan to increase school attendance at the primary level through in school feeding (ISF). Not only does the provision of daily feeding motivate children to attend school. it also supplements the inadequate diet the majority of children in these communities receive. Primary schools apply annually for the government allotment of food covering 60 days out an average 200 school days per year. The food provided follows WFP - ISF guidelines; unfortunately, the food provided covers only 3 months of a 10-month school year, leaving a 7-month food deficit. Through suppliers, food is purchased locally and prepared by school volunteers. This School Feeding Program is run through local schools, currently running the CCP child sponsorship program, and is designed to subsidize the 7-month food deficit in the government program by providing the much needed nutrition through a CSB drink for 1,440 children each morning. This project focuses on the children of the urban poor living on the out skirts of the capital city of Tegucigalpa, Honduras. The schools are in the mountainous range that circles Tegucigalpa. The majority of the households (70%) in the area are single female headed and live on less than 5 dollars a day.